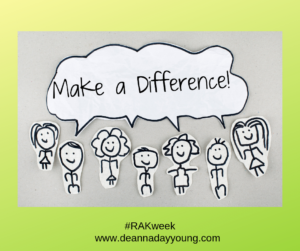 It’s one of my favorite weeks of the year…Random Acts of Kindness Week! Today we get to deliver buckets to Riley Children’s Hospital in Carmel and West Lafayette locations. I love, love, love doing things to make a difference to other people especially when it involves children. Bucket Buddies Mission provides gift buckets of goodies to children who suffer from life-threatening illnesses. My challenge to you this week is to find your own way to make a difference to just one person each day. Monday’s Make A Difference Challenge: Connect with someone you haven’t talked to in a while. Maybe it’s a family member or an old friend. Maybe it’s a church member or friend who has been sick. Who has been on your mind lately? Send them a text. Give them a call. Stop by and visit. Oh how fun this week will be as we all make a difference in our corner of the world, one act of kindness at a time! This entry was posted in devotional, inspirational, motivational, spiritual on February 11, 2019 by Deanna Young.